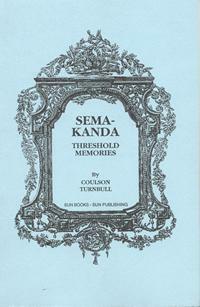 SEMA-KANDA: THRESHOLD MEMORIES by Coulson Turnbull. Ra-Om-Ar and Sema-Kanda, The Brotherhood, The Scroll, Posidona, Ramantha's Lesson, The Great White Lodge, The Destruction of Atlantis, The Two Prisoners, The Congregation of the Inquisition, The Horoscope, Etc. 254 pgs. 5x8. Paperback. ISBN: 0-89540-131-2. $20.00.